The Pixel Buds pack impressively-full sound into a semi-occluded design which rests outside of your ear canal, while the in-ear design of the Zolo Liberty headphones slip into your ear hole to really pump the sound in. The Zolos are able to provide even fatter bass as a result, and and the mids and highs are crisp and clear as well. You’re also not losing any precious sound waves to the world around you, and the secure fit of the ear tip seal makes sure the outside world doesn’t get in either. The result is a rich and immersive audio experience no matter where you are. There is, however, a downside to this immersion: any hisses or white noise present in the audio track are faithfully reproduced, and the tight seal makes these artifacts far more noticeable. This is especially apparent when listening to live orchestra recordings or songs which were digitally converted from vinyl. This isn’t something that’s ever bothered me with the Pixel Buds and, while it may lend authenticity to the audio, I frequently found the noise to be distracting with the Zolo Liberty headphones - particularly at lower volume levels. The in-ear design also contributes to a stuffy feeling between my ears as well as amplifying any “internal” sounds - chewing, throat-clearing, or even just breathing through my nose all caused a sort of booming echo which overwhelmed the audio. 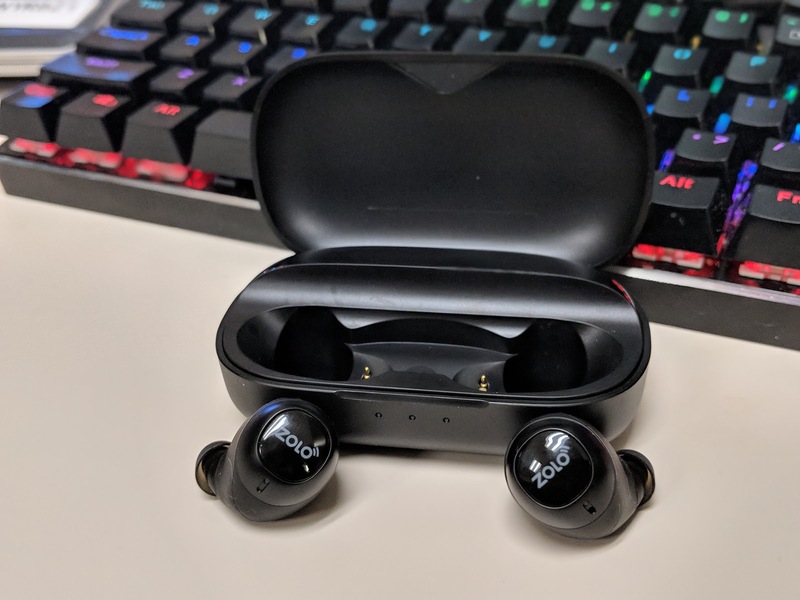 This may not be a big deal to anyone accustomed to in-ear headphones, however my preference for the more open design of the Pixel Buds remains despite the slightly-fuller sound of the Zolo Liberty headphones. 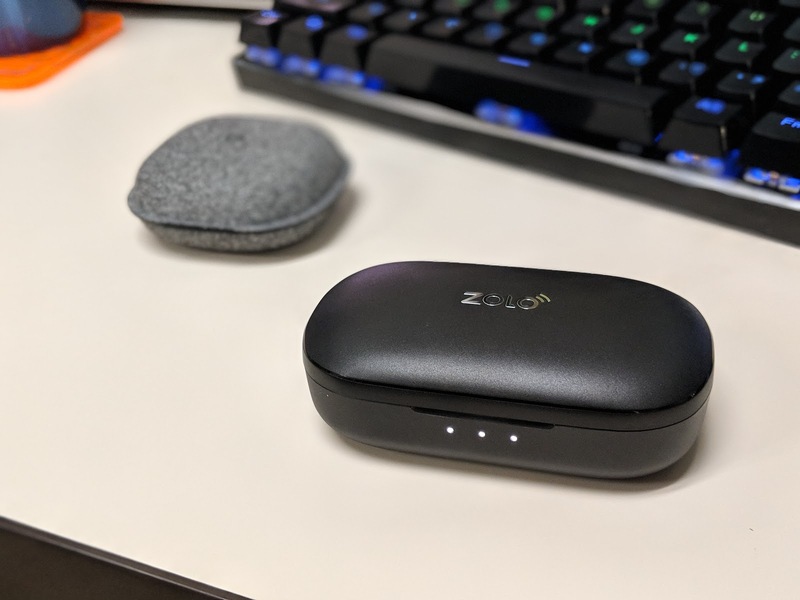 The charging case is my biggest complaint with the Pixel Buds, and the Zolo Liberty charging case really puts it to shame. It’s clear that Zolo put Anker’s charging expertise to good use here. 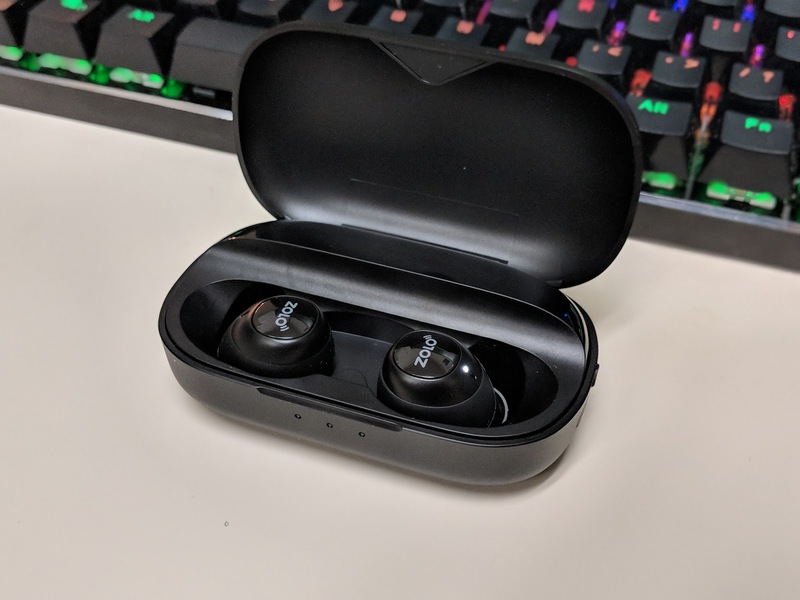 The hard plastic Zolo case is quite a bit bulkier but it packs much stronger magnets to hold the earbuds securely on the charging pins, and that makes the case significantly easier to use than its fabric-clad counterpart. You can effortlessly drop the Liberty headphones into the case and be confident that they’ll start charging right away - while it sometimes takes a bit of finesse to get the Pixel Buds seated just right. This is an easy (and important) win for the Zolo Liberty headphones. Zolo advertises that the headphones will last 3.5 hours from a single charge, while the battery in the case holds enough power for over 24 hours of use. I haven’t intentionally drained the headphones to see how long they’ll actually last, but they haven’t had any trouble getting me through the work day with a mid-day charge while I’m at lunch. The headphones report their current battery level (in 10% increments) to my Pixel 2 phone, and I don’t think I’ve seen them dip below 40% yet. Gently tapping the case illuminates a trio of LEDs on its front to indicate the juice remaining in its onboard battery, and even after a week of fairly consistent use it still shows 2/3 of a charge. If the case does get low, though, it charges easily via its dust-protected micro-USB port - and the retail package even includes a high-quality braided micro-USB cable just in case. The $150 Zolo Liberty+ headphones push the charging case’s capacity to 48+ hours of use, but honestly I have no concerns with the stamina of the $100 base-model Liberty headphones. I tested the Zolo Liberty headphones with both my Pixel 2 phone and my Pixelbook laptop. Pairing with either was very easy and straightforward - maybe not as easy as the quick pairing found with the Pixel Buds on Android (or the Apple Airpods on iOS) but going through the host device’s Bluetooth menu worked consistently with no waiting to see if a pairing prompt would appear. Once paired, it’s easy to switch between devices simply by disconnecting on one and tapping “Connect” on the other. The Bluetooth range is properly impressive, even with Bluetooth 4.2 rather than the 5.0 version found on the Liberty+. I’ve been able to walk throughout my house (and even into the yard!) without missing a beat. In a quiet room, though, I sometimes hear a faint brief high-pitched whine from the left earbud during the dead space between audio tracks. Interestingly, I can also hear it during a song with a brief pause or even when a video gets suddenly quiet. The Pixel Buds also exhibit some faint interference-type sounds when idle but I’ve never heard a peep from them during an active audio stream. The left Liberty earbud also occasionally drops out for a moment or two, especially after pausing and resuming playback. These are minor annoyances but they’ve happened often enough to be an irritation for me. Both the left and right Liberty headphones include a single button which requires a decisive press in order to operate the headphones. This provides a bit more flexibility and better control options than the Pixel Buds, which only include a touch-sensor on the right side and can be prone to accidental touches. Pressing either side once will pause/resume playback, while long-pressing the left or right will go to the previous or next track, respectively. It’s really handy to be able to pause playback with either hand, and I appreciate being able to easily navigate through a playlist without having to reach for my phone. Unfortunately, I do have to grab that phone to adjust the Bluetooth volume since the Liberty headphones don’t provide any built-in volume control. Double-tapping the right side will activate your phone’s default virtual assistant (Google Assistant in my case). I know I’ve been spoiled by the instant response of my Pixel Buds but I was genuinely impressed with how well Assistant works with the Liberty headphones. The interaction works about as well as it does directly on my phone, both for requesting information as well as controlling my connected home devices. My one complaint here is that the Assistant responses (and confirmation beeps) are almost painfully loud, and I couldn’t find a way to adjust it to a more comfortable level. I’m not positive whether this is an Android issue or a Zolo issue but it did cause me to use the Assistant functions less frequently than I otherwise would. I mentioned earlier that both earpieces include the same components but that’s not entirely accurate: only the right side is equipped with a microphone. This is why the double-tap-for-assistance action only works on the right side, and also (interestingly) allows you to use only the right earbud while leaving its partner inside the charging case. You can’t, however, use only the left earpiece. I’m sure there’s a technical reason for this limitation but from a user perspective it feels a bit arbitrary. Many of these minor issues could probably be corrected with a firmware or software update (just as such updates have brought significant enhancements to the Pixel Buds since their release). Sadly, the Zolo Life mobile app only supports the more expensive Liberty+ headphones and not the base Liberty ones. This means no voice assistant configuration, no equalizer adjustments, and (most disappointingly) no ability to update the headphone firmware to correct some of the behaviors I’ve mentioned here. While the experience with other Bluetooth headphones may improve over time thanks to software/firmware updates, the Zolo Liberty headphones will not. Overall, the Zolo Liberty True Wireless In-Ear Headphones are very good Bluetooth headphones. Their charging case is fantastic, battery life phenomenal, sound excellent, and range impressive. They are a bit too bulky to fit my ears comfortably, and I really prefer a more open (non-in-ear) design - but those are really personal preferences. The handful of minor issues I’ve encountered do detract from an otherwise stellar experience (and no hope of improvement is a bummer) but I would still happily recommend these headphones to anyone in the market for a ~$100 pair.